NASA is a United States agency that explores space. The letters of NASA’s name stand for the National Aeronautics and Space Administration. 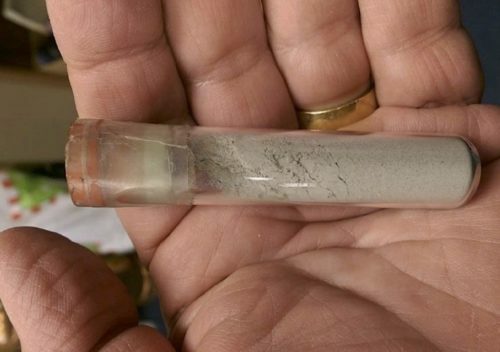 When Laura Murray was about 10 years old, she was given a glass vial (small bottle) of dust. Now, almost 50 years later, she’s taking NASA to court to keep that bottle. Why? 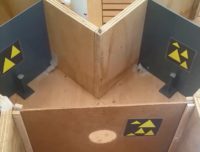 The dust inside came from the moon. Many things have happened since she was given the vial of moon dust. Laura Murray has grown up, gotten married, and now her name is Laura Cicco. Her parents have died, but they played an important part in the story. Astronaut Neil Armstrong was a friend of Ms. Cicco’s father. Ms. Cicco’s father was a pilot, and he was friends with the American astronaut, Neil Armstrong. 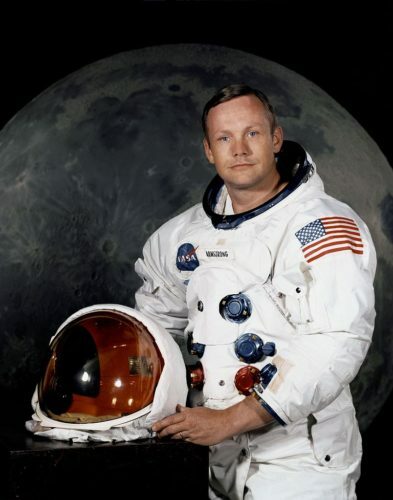 Neil Armstrong is famous for being the first person to ever walk on the moon. Mr. Armstrong gave Ms. Cicco’s father the vial of moon dust as a gift for Ms. Cicco. 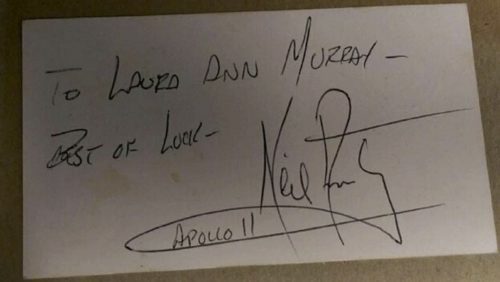 He also wrote a note on the back of one of her father’s business cards: “To Laura Ann Murray, best of luck, Neil Armstrong, Apollo 11”. As a child, even though she kept Mr. Armstrong’s note in a frame, Ms. Cicco wasn’t too interested in the moon dust. In fact, she forgot all about it. “I was more interested in Barbie dolls and riding my bike,” she told one newspaper. Ms. Cicco didn’t see the vial again until about five years ago, when she was cleaning out her parents’ house. Astronaut Neil Armstrong gave Ms. Cicco a vial of moon dust when she was a girl. She is taking NASA to court to keep it. Now, Ms. Cicco is suing NASA – taking them to court. Why? Ms. Cicco is afraid that NASA might try to take her moon dust away. She wants to keep that from happening. NASA is the US government group that made the trips to the moon possible. Neil Armstrong worked for NASA. Until recently, NASA has been in charge of almost all US trips into space. 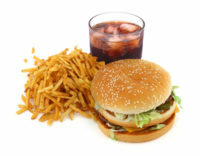 And NASA has rules about the things its astronauts can take with them. In 2012, about 40 years after Ms. Cicco was given the moon dust, Congress made a law for astronauts. It said that they could take home some small things from their trips. But the law made it clear that this did not include anything collected on the moon. NASA says that private people can’t own things from the moon. Rocks and dust from the moon are very valuable because they are so unusual. In 2002, three people stole $21 million worth of moon rocks from NASA. 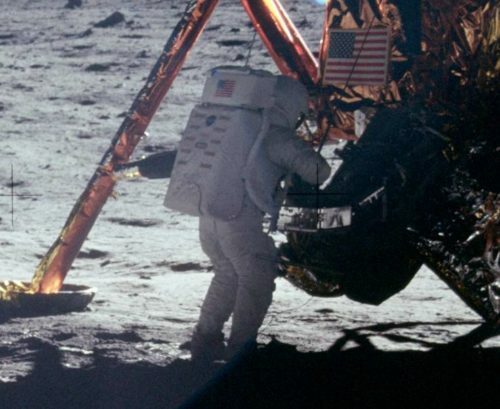 An empty bag that was used to collect samples on the moon sold for $1.8 million last year. The bag had a tiny bit of moon dust inside it. Since 2012, NASA has taken other people to court and tried to get back any pieces of moon rock that they had. NASA has said that private people “cannot own lunar material”. “Lunar material” means bits of the moon. So Ms. Cicco and her lawyer, Chris McHugh, are going to court to make sure that NASA doesn’t try to take Ms. Cicco’s moon dust away. Mr. McHugh doesn’t see any reason why a private person can’t own bits of the moon. He says that Ms. Cicco got the moon dust from Mr. Armstrong as a gift, and so it is hers. NASA has not said anything about the case.